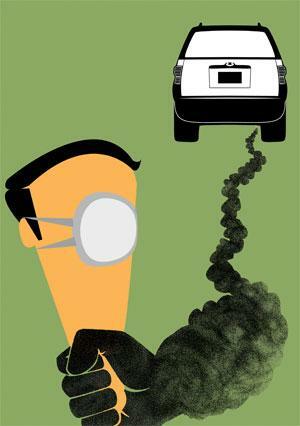 The country has a massive problem of older and more polluting vehicles. But why should this be an argument for delaying transition? Why this huge fuss? I am talking about the automobile manufacturers’ insistence that huge injustice has been done to them because they have been asked to move to Bharat Stage IV (BS-IV) technologies for emission control before the due date. The government notification they are using in their defence says companies would stop making Bharat Stage III (BS-III) vehicles by March 31, 2017. The companies say this does not mean that registration of BS-III vehicles would be stopped as of April 1, 2017. Automobile companies, ably represented by their association Society of Indian Automobile Manufacturers, say as a result of the decision to stop registration huge inventories have piled up. This means huge losses for them and for the country. This is injustice, they say. I ask the question because I was involved with this decision—first taken by the Environment Pollution (Control and Prevention) Authority for the National Capital Region (NCR), or EPCA; and then by the amicus curiae in the air pollution case, Harish Salve; and finally, by the Supreme Court. I write this both to explain my position and to ask, once again, humbly: why the fuss? Let’s understand the issue. Firstly, vehicles contribute to the pollution that is making us ill. Secondly, improving the quality of fuel and vehicle technology is a critical way to clean up emissions. But thirdly, this improvement in fuel quality and technology has always been hard-fought. It has always come in spite of Indian automobile companies and not because of them. It was in April 1999 that the Supreme Court had directed that all vehicles in India would have to meet Euro I (BS norms were not fashioned then) by the June of that year. It also directed that Euro II would be mandatory in the NCR by April 1, 2000. At that time, the court had set a precedent by directing that “no vehicle shall be registered unless it conforms to Euro II norms”. The telling one-liners from the apex court at that time should remind us of today. In May 1999, counsels for automobile companies argued for more time to implement the Euro norms. The court remarked in obvious sarcasm, “People can’t breathe and you are asking for more breathing time!” The transition happened in Delhi and NCR. Leading companies pushed for technology improvement and the laggards caught up. The government set up a committee under R A Mashelkar to finalise the road map for clean fuel technology for the country. In 2003, it was agreed that Delhi, NCR and 12 other polluted cities would get BS-III by April 2005, and the rest of the country by April 2010. Then there was a pause. The 2008 notification only said that Delhi, NCR and 12 other cities would get BS-IV by 2010. In 2015, the road map for the rest of the country was decided—fuel would be progressively made available and technology transition would happen. The deadline was April 1, 2017, when the entire country (barring small remote pockets) would switch to 50-ppm-sulphur fuel as compared to the 350 ppm fuel available till then. The automobile companies, therefore, knew well in advance that the fuel would be available across India by April 1, 2017. The transition to BS-IV is also not new as technologies have been available since 2010. The date of “manufacture” is, then, only a technical argument. The only constraint, that of clean fuel being available nationwide for long-distance carriers like taxis and trucks, has been removed. The case of two-wheelers is slightly different. These are largely petrol vehicles, so fuel is not such a constraint—diesel has high particulate matter and emission control requires stringent quality control in fuel. The vehicle manufacturers were given an entire year, April 2016 to March 2017, to switch over to BS-IV. Again, the companies knew and the transition should have been seamless. But it was not. This is my fourth point. EPCA, of which I am a member, had convened a meeting in October 2016 to discuss this switch date. Our position was that since clean fuel would be available by April 1, 2017, at a considerable cost to the public exchequer, companies should plan their inventories accordingly. The objective was to ask them to reduce the production of BS-III and to ramp up the manufacturing of BS-IV. Instead, the data supplied by the companies to the Supreme Court shows that most of them continued to produce BS-III vehicles at the same or even increased rate. This then built up inventories. The fifth issue is that this transition matters. BS-IV vehicles, particularly diesel trucks, are much less polluting than BS-III. There is 80 per cent reduction in particulate emissions between the two generations. That’s why bringing cleaner vehicles into the market as fast as possible matters. No doubt the country has a massive problem of older and more polluting vehicles. But why should this be an argument for delaying the transition? After all, vehicles have a life of 10-15 years. The faster the new stock takes over the better it is. How can there be any argument on this? Tell me. Please. Delhi government budget: are we losing public transport agenda of aam aadmi?